The forecast called for moderate northwest wind today, so we were hoping for a chance to fly the north shore. But all morning the conditions stayed pretty darn west and strong, and it wasn't clear how it was going to transition from that to tonight's forecast for zero wind. Well, it turns out the transition was going to be fast. Six of us showed up to try and thread that needle: four of us flew, and two of us worked hard to stay up a while in the weakening conditions. 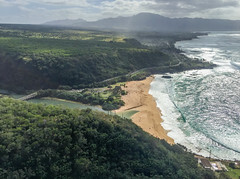 But I have to say that is my favorite kind of day out there, connecting thermals to wind my way down the ridge to Waimea. Drew and Steve showed up first. Drew launched his freshly repaired Golden and scratched his way over to Comsat ridge. Steve launched his Freestyle and slowly sank down to the pasture. I launched my old IP6 as Drew was returning, and I caught a nice one at the Kahuku end of the ridge. I passed Drew and headed to Comsat, where I caught another nice one and continued to Sunset. There I caught another nice one and hopped to Pupukea, where I didn't catch any nice ones. I soared over to Waimea, and then thought better of fighting my way back in the slackening flow, so I landed at the beach in front of the beer store. Meanwhile Allegra launched and scratched for a while before following Steve down to the pasture. Drew joined her down there as well. Duck picked up some green bottles for our buddy Rich, the caretaker of the farm. Thanks Duck! And thanks to Duck and Steve for the retrieve and the tasty refreshments! Great to see Larry Mac out there as well. Thanks for shooting video of my landing! I had to w**k again and glad there are some new chasers in the ranks to keep a fire under Alex. Another fine coffee read, getting flights during these bleak winter moments is hard enough. But to get some ink and video is a bonus. I just wish the other monkeys would learn how to scratch-one, a story that is, I bet Drew would be a hilarious spinner of tales. Not to dis this prolific author, just say'n an occasional funny story from foreign ink would be nice. Coffee was good and needed on this chilly morning.